I walked this circular walk from Alstonefield, photo 1, with Paul on Sunday 19th March 2006. 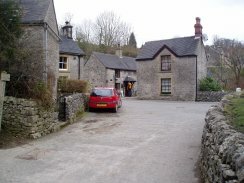 We had driven the short distance over from Hartington and parked in a small car park next to some public toilets in the centre of the village. Although still quite grey and windy the weather was considerably milder than the previous day. From our parking spot we headed right up the road and then turned left into Lode Lane until we reached the turn off for Overdale which leads past the small Alstonefield Youth Hostel. 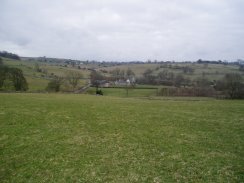 As we progressed along the track there were views across the fields towards Dovedale, photo 2. 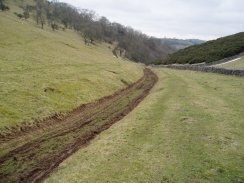 This track, photo 3, became gradually became narrower and more muddy as it wound its way in a North Easterly direction between fields towards Dovedale. 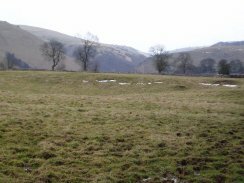 As the track neared Dovedale it started descending slightly and we noticed lots of daffodils growing beside the path although these were nowhere near flowering. I was unsure whether they had been planted there sometime in the past or occurred naturally. 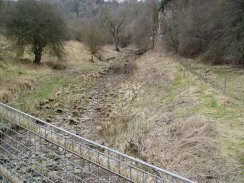 Eventually the track reached Gipsy Bank, photo 4, and we were able to look down to the River Dove below. 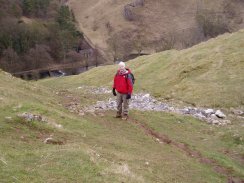 The path descends very steeply down into Dovedale and for a brief while I regretted leaving my walking pole in the car as it would have come in very useful on the way down. 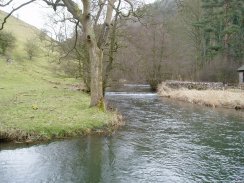 As it was we were soon down in the bottom of the valley at Coldeaton Bridge and besides the River Dove, photo 6 which we then followed downstream towards Ilam. 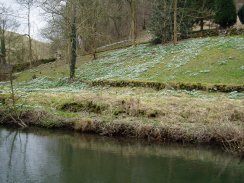 As we neared Shining Tor we passed a house whose grounds were covered in a mass of snowdrops, photo 7, although the photo doesn't really do them justice. There then followed a short stretch or road walking down towards Milldale. On the way I spotted a pair of Goosander on the river along with a heron quietly fishing from the riverbank. I spent ages trying to get a decent photo of the Goosander but they kept moving back and forth and eventually took off. 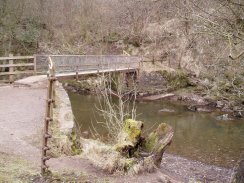 The stretch of road walking ends at Milldale, photo 9, and the path crosses to the other bank over the Milldale Bridge, photo 8. As we progressed down the valley the scenery gradually became more dramatic. 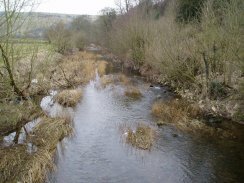 Photo 10 shows the river by Dove Holes. 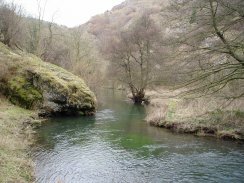 Continuing down river we past Ilam Rock, photo 11, along with the other feautures such as the Tissington Spires, the Twelve Apostles and Reynards Cave which make this area so popular. Just past the Ilam Rock the river narrows, photo 12, and a little further on a section of boardwalk has been built. 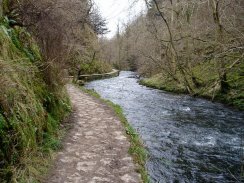 Walking along this section I spotted a number of grey wagtails hopping about the edge of the river and perched on branches. I also saw a number of dippers sitting besides the river on the opposite bank. 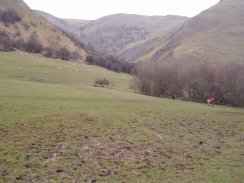 Eventually we reached the end of Dovedale. The stepping stones were flooded so we crossed over the river at the footbridge near the car park. Even though it was a cold grey March day the car park was packed with visitors. 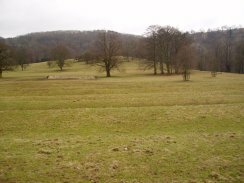 From the car park we headed up a footpath that runs across fields behind the Izaak Walton hotel towards Ilam. The stretch of three of four fields was incredibly muddy and it was impossible to keep our boots from becoming covered in muddy. 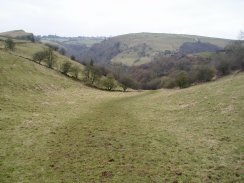 The boggy nature of the ground can just about be made out in photo 13 which was taken looking back towards Dovedale. 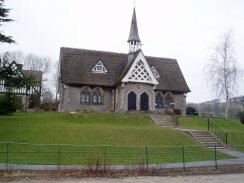 We followed the road round to the right through Ilam, past its picture book houses to a track that led off to the left into Ilam Country Park, more or less opposite the Ilam School, photo 14. 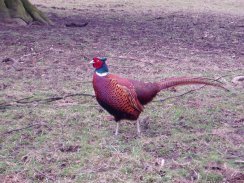 On the way through Ilam Park we came across an extremely brave pheasant. Most pheasants I have come across while out walking run of before you get anywhere near them but this one stood its ground while I got my camera out to take a photo, photo 15. 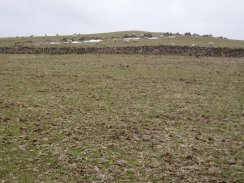 Within the park there were numerous ridges in the ground, photo 16, that marked the remains of an old field system, now long disused. 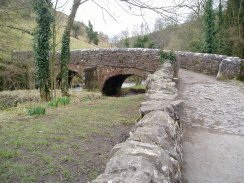 Leaving Ilam park we crossed a bridge over the River Manifold, photo 17 before making our way along a path that rises uphill in a North Westerly direction over fields below Musden Grange towards Rushley. Once again these fields were very boggy to walk across but fortunalty though this was the last really bad ground we had on the walk. From Rushley we passed through a farmyard and on to a path that heads up through Musden Wood which is situated in a small steep sided valley, photo 18. 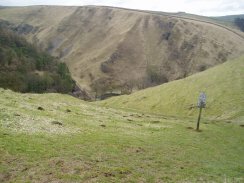 As we reached the top of the valley, not far from the village of Calton we took a path to the right that ran in a Northerly direction climbing steadily uphill over fields to Slade House. 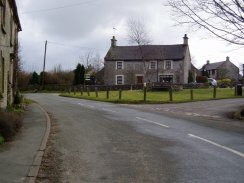 We walked along the driveway of Slade House to Farwell Lane, crossing the highest ground of the day on the way at 331 metres. The bleak high moorland fields, photo 19, in stark contrast to the valley we had just climbed up. Crossing Farwell Lane we started descending across open moorland below Throwleymoor Farm, photo 20. 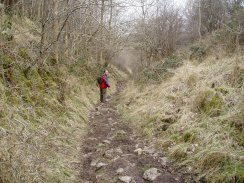 The path eventually become more defined and the descent steeper as we reached Soles Hollow, photo 21, before entering a patch of woodland, photo 22, that lead down to the Manifold Way, an old railway line that has now been paved over for use by cyclists and walkers. 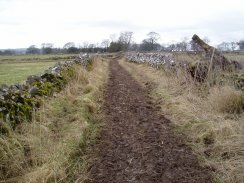 This part of the Manifold Way runs besides the River Hamps although this was completly dried up when we were there, photo 23. Apparently the river generally runs underground except at times of high rainfall, rising to the surface along with the River Manifold besides Ilam Park. 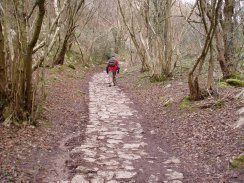 We turned right along the Manifold Way and soon reached the River Manifold itself. This river is also said to run only underground at certain times at this part of its course however the the river was reasonably full when we went past. We then continued North up the Maniofld Valley until we reached Thors Cave, photo 24. 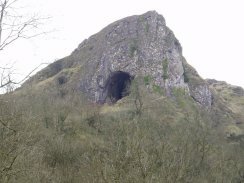 This huge cave stands a couple of hundred metres above the valley floor. 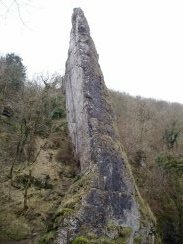 According to an information board the limestone in which the cave was formed was laid down between 280 and 360 million years ago when the area was South of the equator. Bones of giant Red Deer and Bears have been found in the cave and the cave was the site of a bronze age burial. Just past the cave we crossed over a small bridge across the River Manifold, photo 25, and headed up a track, photo 26, that lead towards Wetton. The lower part of the track has recently been surfaced which made the walking uphill a bit easier. 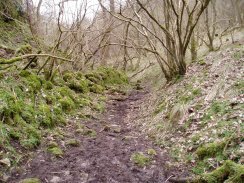 Eventually the track leaves the woodland and heads across fields to Wetton. Photo 27, was taken looking back in the direction of Grindon over the Manifold valley we had just climbed out of. Reaching Wetton we turned left along a road then right along a path that leads down past the village hall and church, photo 28. 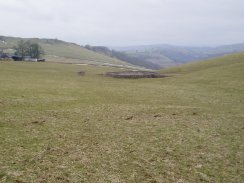 From Wetton it was then a short walk in an Easterly direction back to Alstonefield. 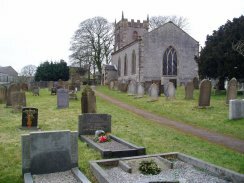 From the church we headed down a track and over fields to the Ashbourne Road. A short distance down the road we took a footpath off to the left that descended gently across fields, photo 29, to Furlong Lane and then climbing up to cross Furlong Lane again, and over the final three fields to Alstonefield which can just be made out on the horizon. 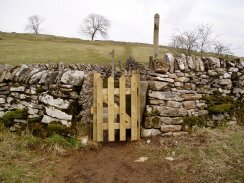 I lost count of the number of little wooden gates and there accompanying narrow stone gateways we past through during the walk, many like the one in photo 30 seemed quite new and well maintained, evidence of a bit of money being spent on the footpath network which is a good thing. Everywhere the paths were clearly marked and easy to follow which made navigation very easy too, altogether a very enjoyable day. The GPS made this walk 13.5 miles long.